By Chris Williams: Ring Magazine came out with their new top 10 pound-for-pound ratings on Thursday, and one notable change is IBF welterweight champion Errol Spence Jr. sliding into the #5 spot ahead of former IBF/WBA/WBC middleweight champion Gennady Golovkin, who has been demoted to #6. Spence, 29, is coming off of career best win in beating four division world champion Mikey Garcia by a 12 round unanimous decision last weekend on Fox Sports PPV. In contrast, Golovkin (38-1-1, 34 KOs) lost his last fight to Saul Canelo Alvarez, albeit by a controversial 12 round majority decision in September of 2018. Golovkin could move back up to the top five if he faces someone good in his next fight in June and wins. 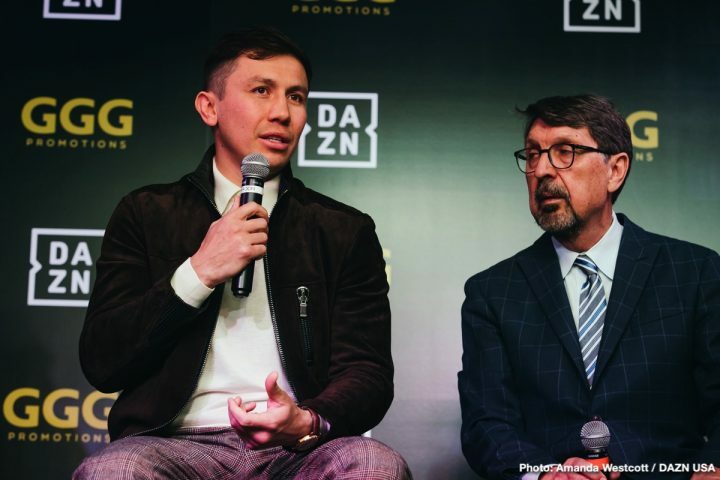 However, the two names that are rumored to be options for GGG’s fight in June, Brandon Adams and Kamil Szeremeta, aren’t big enough talents for Golovkin to get a higher ranking in Ring Magazine’s rankings if he wins. IBF/WBA/WBO heavyweight champion Anthony Joshua didn’t make Ring Magazine’s top 10 for some reason. One possible reason for that is how Joshua has been getting hurt a lot by his opponents. Joshua’s last opponent Alexander Povetkin, 39, staggered him in the early going last September. Carlos Takam had Joshua troubled at times, and Wladimir Klitschko almost knocked him out. Joshua’s win over Joseph Parker was tainted due to the referee seemingly giving him a hand by not allowing inside fighting, which crippled Parker’s game. With the referee not allowing inside fighting, Parker had to stay on the outside the entire night. The combination of Golovkin losing to Canelo and him being inactive for six months likely hurt his rankings with Ring Magazine. Mikey Garcia (39-1, 30 KOs) remains in the top 10 at the #9 spot despite losing to Spence. Ring Magazine obviously must have felt that Mikey fought well enough against Spence not to be dropped from their top 10. Spence wasn’t able to knockout Garcia, 31, or even knock him down. However, some boxing fans feel that Spence was intentionally taking it easy on Garcia by not pressing him the way he normally does in his fights. Had Spence fought Garcia the way he did against Chris Algieri and Oscar Ocampo. Terence Crawford is holding steady at #2 on the P-4-P list. He would likely get pushed up to #1 pound the list if he would beat one of the top welterweights, but thus far, Top Rank hasn’t put him in with any of the good fighters at 147. Crawford’s only two fights at welterweight came against Jeff Horn and Jose Benavidez Jr. Those guys aren’t seen as being in the same class as the elite welterweights (i.e., Errol Spence Jr., Keith Thurman, Yordenis Ugas, Shawn Porter and Danny Garcia), and it’s going to take some better match-making by the promotional company if want Crawford to get pushed higher. Crawford (34-0, 25 KOs) is scheduled to defend his WBO welterweight title against Amir Khan (33-4, 20 KOs) next month on April 20 on ESPN pay-per-view. Although Khan is former world champion and is highly known, he’s not one of the elite fighters in the welterweight division. Beating him isn’t going to help Crawford take the #1 spot in Ring Magazine’s pound-for-pound ranking. Crawford and Lomachenko haven’t done enough for them to be rated #1 and #2 in this writer’s opinion. They’v had too many soft fights between them lately for them to be in the top five pound-for-pound. You hate to say it, but there’s been a lot of fodder shoveled into the ring for Loma and Crawford to feast on.